This colorful coleslaw is the perfect addition to grilled fish & meat. The lively color is from the red and green cabbage with flakes of orange from the carrots. The unique sauce is made from Deer Creek Farms “The Blue Jay”, quintuple cream blue cheese infused with juniper berry. Juniper berries? Let’s just say this coleslaw would go fabulous with a perfectly chilled Gin Martini. Though they are best known for being the predominant flavor in gin, juniper also compliments heavier meats, game and some vegetables like cabbage. Their flavor comes off as a cross between rosemary and berries. It has more of a crisp clean mountain air feeling than a strong pine aroma. So once you take the strong flavor of blue cheese, the acidity of the red wine vinegar and the heftiness of the cabbage, the juniper berry brightens them all into a sunny meadow of tastiness. 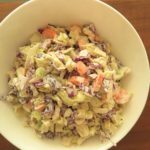 This juniper infused coleslaw also adds a new dimension to BBQ Pork Burgers, BBQ Shredded Pork Sandwiches or with Beef Brisket. 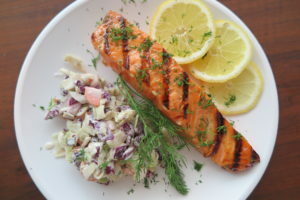 Try it with our Michigan Salmon Bake Recipe. Rinse and remove first two layers of leaves from both cabbages. Cut in half and remove core. Slice cabbage into ¼ inch slices and then chop into ¼ inch pieces. Cut carrots into ¼ inch slices. Set to the side. Combine all the ingredients and mix together thoroughly. Add to diced cabbage and carrots. Mix thoroughly. Chill for a couple hours. Stir before serving (the moisture from the cabbage will separate from the sauce). Add your favorite barbeque sauce to ground pork (about 1/3 cup per pound). Form into burgers. Grill till well done. Toast Kaiser rolls on the grill. Top BBQ Pork Burgers with confetti coleslaw and serve.